Update/spoiler alert: I bought the Sonos Playbar and am very happy with it. A co-worker has bought the Sony soundbar and is happy. Lastly, someone on Twitter followed my advice and bought the Player and is also happy. My wife and I watch a lot of movies and television. Now we don't have cable or an antenna, so everything we watch is either rented digitally, on Netflix, or some Blu-ray we own; yes we are actual cord-cutters since I cut in 2000 and Andrea cut in 2009. But this also means we are constantly picking up quality shows and movies which are the kind of thing that grab us enough to watch an episode or two a night or a full-blown movie. What this means is even though programming is my passion but not for Andrea, a love of a good story told through moving pictures is shared between us and something we can do together any day of the week without issue. What this means is that we spend a good amount of time in front of our TV relaxing. With me being a tech nerd it also means I try to have good A/V equipment. We have a 47" Vizio TV which is at an optimal distance from the sofa (yes, I calculated it, measured it, and pulled the sofa forward to meet the measurement). We have a ps3 partially because it’s the best Blu-ray player available. We actually buy Blu-rays because of the video quality. Our TV has passive/theater 3D which we actually use and buy videos for (it’s actually quite good; better than in the theater by a decent margin). In other words I try to keep our A/V setup up to snuff based on the space the TV is in to maximize our average nightly activity without totally blowing out the budget. But the one place where I have felt we are currently skimping on our TV setup is in sound. Before I met Andrea I had a Sony 5.1 sound system. It wasn't much since I lived in an apartment and I was a student, but I appreciated the surround sound for video games. Unfortunately it didn't work for Blu-rays (damn you, HDCP), but I had a taste of the difference a little bit of money can buy you aurally. So I’m interested in upgrading our sound setup for the TV. There are some restrictions, though. Being one who likes to keep things relatively picked up, the idea of having cables snaking around does not please me. Being a renter means I can’t easily rip up the carpet or anything to run cables. And lastly, Andrea doesn’t like the idea of any visible cables either (our router, modem, and NAS are in two nice-looking storage boxes to hide the wires). That means no wires running to anything past the TV stand. Andrea also doesn’t want our A/V system dominating the room it’s in. Me being me, I disagree when it comes to the TV but I understand not wanting a big, honking piece of black glass taking up the majority of your wall. But this aesthetic extends to the speakers as well, which I do totally understand since speakers are not usually the most attractive things in the world. That means not having tower speakers or anything overtly large and obnoxious. With those restraints in place, I have come to the conclusion that a decent soundbar will fit the aural bill. I have spousal approval thanks to soundbars not taking up too much space or being ugly. I like them as they are a good bang-for-the-buck solution when your TV is in a spare bedroom — and will be for the foreseeable future for us — and not in some large den or open concept living room. Soundbars make everyone happy. If you look out there for reasonable soundbars that sound good for the price and match our constraints, there seem to be four options at the time of writing. 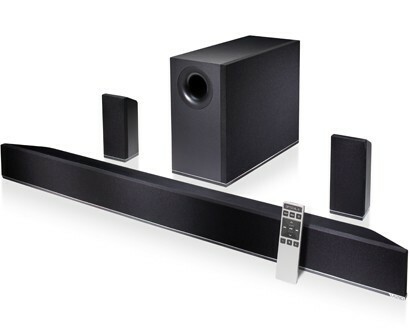 On the low end there is the Vizio S4221W-C4 2.1 soundbar. It’s US$250 and just your basic 2.1 soundbar. Nothing crazy, but affordable and sounds good for the price. 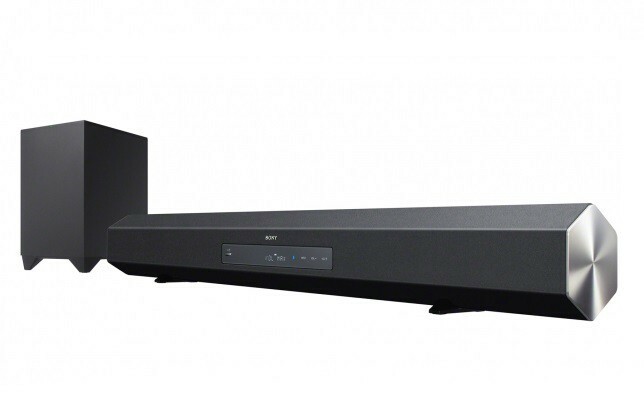 Next up the price chain is the Sony HT-CT260 soundbar. According to The Wirecutter it’s the best budget soundbar (their not-budget soundbar is US$1,500 so that category is being ignored outright). It’s US$300 and simply higher quality in terms of sound as compared to the Vizio 2.1 soundbar. 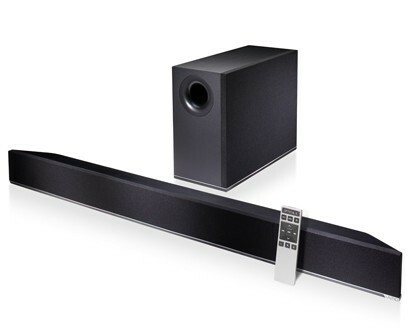 Going one step above that is the Vizio S4251W-B4 5.1 soundbar. Yes, it’s a 5.1 system for USD 330. The subwoofer is wireless and the rear speakers just plug into the sub (no separate power cables) so getting to hide the speaker under the sofa passes the wife + renting wireless test. 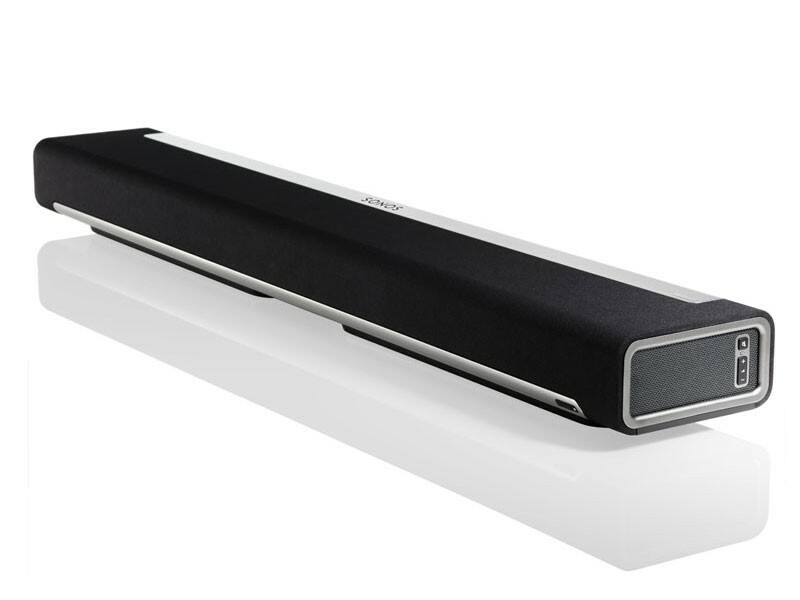 It’s also the step-up pick by The Wirecutter in their budget soundbar category. A lot of reviews knock the Playbar for its lack of subwoofer/bass response; you need to get the Sonos Sub at USD 700 for that. If you toss in two Play:3 speakers — for another 2 x USD 300 = USD 600 — you now have a 5.1 soundbar system with great sound quality … after spending USD 700 + USD 700 + USD 600 = USD 2,000. It’s definitely a way to slowly build your way up to a high quality 5.1 system, especially if you want to replace Play:3 speakers around your house with Play:5 speakers over time, but rather pricey in the long run (although Home Theater claims it’s worth the price). But one of the real knocks for this idea of eventual expansion — there’s another I will get to in a bit that is more general to soundbars — is the Playbar cannot decode DTS which a lot of Blu-rays have as their primary English audio track encoded in. That makes the idea of upgrading to 5.1 very unappealing and in no way a goal beyond perhaps adding the subwoofer. Which brings us to a fundamental issue with soundbars: they pretty much universally expect you to take the sound output from your TV (typically optical audio out). This is a problem as many TVs don’t pass through audio from other inputs into the TV in anything but 2.0 audio. Now in our case our TV will pass through Dolby Digital or PCM which isn't perfect as Blu-rays typically use DTS which means it will be downsampled to 2.0 audio. While the Playbar will be fine with that, it does mean the other 3 soundbars would lose out on the subwoofer channel if provided. This is obviously minor, though, since the other soundbars will simply try to deduce what the subwoofer should output based on sound levels. The only way to really work around this issue is to either manually swap the audio cable between your multiple devices or only have a single device for all of your A/V needs. As of right now we only use the ps3 so we could directly pipe the optical audio from the ps3 to the soundbar and thus skip any bad downsampling to stereo PCM or Dolby Digital 2.0 when that would make a difference. This is only something to care about if your soundbar is 5.1 (e.g. the high-end Vizio soundbar) or could be in the future (e.g. the Playbar). Home Theater has a short article on this issue in case I did a bad job explaining it. But in reality this only affects soundbars in a 5.1 setup since taking a stereo signal for a 2.1 system to 2.0 is not a big deal. So I can either go across the border and hope that the border agent on the way back in doesn’t tax me, buy one on the way back from a a two night stay in the States, or I pay the slightly higher prices and give up on Vizio. Typically I pay the higher price when possible to support companies that put in the effort to actually be here in Canada and to have an actual warranty. Any Americans reading this, realize that not everything you have is available up north and it is annoying. Where does all of this leave me and my wife in terms of making a decision in our specific case? Basically it’s either Sony or Sonos, and it’s up to Sonos to beat the Sony in some price/quality comparison. Thanks to the lack of DTS and TVs typically not passing 5.1 sound through their audio out, the Sonos is competing on its own/potential CAD 1,500 3.1 soundbar system, not as a potential CAD 2,160 5.1 system (and that potential part is key since I won't be spending that kind of cash at once, otherwise I would consider shelling out all of the cash upfront and get the CAD 1,650 MartinLogan Motion Vision as recommended by The Wirecutter and Wired). I don't think the quality of sound is really in dispute. Outside of C|Net, everyone thought the sound was great: Engadget, TrustedReviews, Home Theater, The Verge, PC Magazine. They all agree that adding the subwoofer takes the sound up a large notch to really great quality, but on its own it’s still very good. They also all pointed out the optical audio out issue with televisions, but since I'm ignoring the 5.1 surround option that’s not an issue for me. What it really comes down to is price. The Playbar is CAD 400 more than the Sony. That seems like a lot, but the key thing here is that our household has already bought into the Sonos ecosystem, which means if we decided we wanted a Sonos system in the TV room, that would be CAD 330 for a Play:3. That makes the price difference about CAD 70 between the Sonos and the Sony which is roughly a tax on having one less device in the TV room.